Dental Implants in Santa Barbara - Dr. Mark T. Weiser — Dentist in Santa Barbara, CA | Dr. Mark T. Weiser D.D.S. Dental Implants are the perfect solution to tooth loss and a great way to get rid of your dentures. Implants look, feel and function like natural teeth. They are used to replace individual missing teeth, or they can support bridgework or dentures. Once placed, they help to preserve bone and allow the patient to exert greater biting forces. 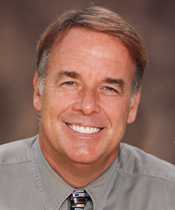 Santa Barbara restorative and cosmetic dentist Dr. Mark T. Weiser has extensive experience in this area of dentistry. The best way to determine whether or not this is the right decision for you is to book a consultation to discuss it. Dental Implants Technology Lasts A Lifetime. 3) The crown (or prosthetic tooth): This is the part of the tooth that you can see. It’s usually made of porcelain for durability and aesthetic purposes. “Do you suffer from cracked, worn or failing teeth? As one of Southern California's premier implant dentist, I can give you back your smile. People from around the world trust my team to provide permanent teeth that look, feel and function like strong natural teeth. Call me today for a free consultation. I'll walk you through the entire procedure, including cost." Improved quality of life - confidence, eat what you want. A dental implant can replace a single tooth in one or more locations and it can also be leveraged to replace several teeth with a bridge. Dental implants consist of a titanium screw and a crown, denture, or bridge. The titanium screw fuses to the jaw bone and serves as a tooth root. Not only are they preferable to many as an alternative to dentures because they are not removable but they help maintain jaw bone mass, too. If your assessment before dental implants surgery indicates lack of bone available to make the chances of dental implants success low, we may recommend a bone graft. Before you can find out whether or not you are a good candidate for dental implants, you’ll want to find a skilled implant dentist. Dr. Mark T. Weiser is a skilled Santa Barbara dentist with an excellent track record with dental implants and in other areas of general, cosmetic, and restorative dentistry. Dr. Weiser can provide you with information about dental implants including, costs, procedures, and timelines. Dr. Weiser will first determine, through a screening process, if you are a good candidate for dental implants, whether or not you have sufficient bone in the jaw to support a dental implant, and will help you understand the entire process so that you can feel comfortable with your decision. Dr. Weiser takes x-rays, sometimes prescribes CT scans, takes impressions for customized crowns, and through several appointments you can go from having decayed, damaged, or missing teeth to dental implants that look natural, that act natural, and that are permanently attached in your mouth. Those who have transitioned from dentures to dental implants comment that the difference is significant in eating, talking, and in taking care of their teeth. Dental implants are the closest thing to natural teeth and can provide a great return on your investment. Our Santa Barbara dental office is a holistic dental practice with a comfortable spa-like environment. Our team treats every patient with care and compassion and we also offer dental financing so that the cost of dental implants does not have to be prohibitive for you. Contact Dr. Weiser’s office at (805) 899-3600 to book your dental implants consultation.